Steep, sparsely vegetated, fine sand road cut on the Nebraska Pine Ridge escarpment. The vast landscape surrounding the Nebraska Pine Ridge boasts two entirely different natural communities – the High Plains shortgrass prairie atop the ridge stretching endlessly to the south, and the eerie, desolate Badlands on the north side of the ridge extending to the Black Hills of South Dakota. Separating these two distinctive communities is the Pine Ridge escarpment itself – a precipitous 1,400-ft drop whose ponderosa pine forests and sage brushlands are more reminiscent of the Rocky Mountains some distance to the west rather than the Great Plains that surround them. 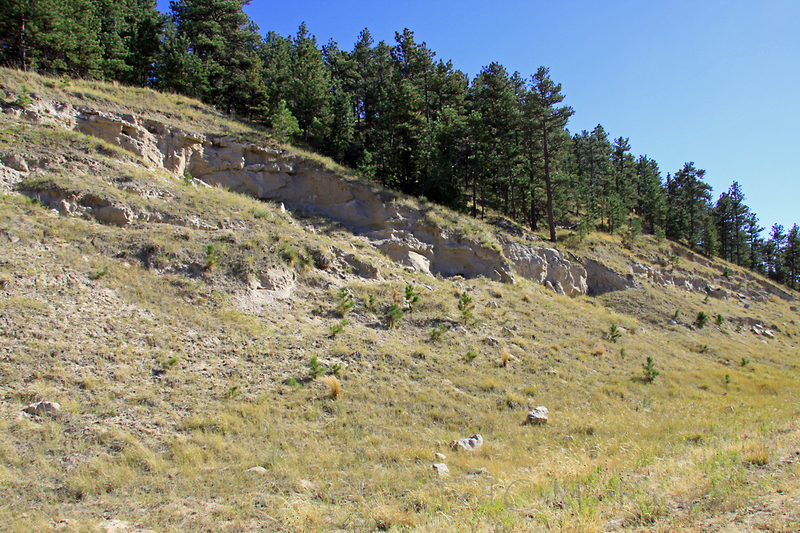 Instead of hard igneous and metamorphic rocks, however, the Pine Ridge is composed of soft, erodable sand- and siltstones, giving rise to canyons with dramatic white bluffs and escarpments. One of the more scenic of these is Monroe Canyon, located six miles north of the tiny town of Harrison and part of the Gilbert-Baker State Wildlife Management Area. I first explored Monroe Canyon two years ago, when Matt Brust took me there after our successful quest to see Cicindela nebraskana (prairie long-lipped tiger beetle) in the prairies above. The steep, eroded road cuts in Monroe Canyon had become one of Matt’s favorite spots to look for tiger beetles, but on our visit there was not much going on save for single individuals of the ubiquitous sand-loving species Cicindela formosa (big sand tiger beetle) and Cicindela scutellaris (festive tiger beetle). Still, the fine, deep, sparsely vegetated mixture of sand and silt extending far up the embankment is classic tiger beetle habitat, so when Chris Brown and I returned to the area this past September, we decided to give Monroe Canyon another try. As I began my umpteenth pass along the lower stretch of the embankment, I heard Chris call out, “I’ve got it!” Chris hadn’t previously seen this species, so I fully expected when I walked over to where he was standing that I would find instead the much more common and amazingly similar C. formosa. However, when I spotted the adult as he pointed to it, there was no doubt – the longer, obliquely straight humeral lunule (shoulder marking), the slightly more cylindrical, parallel-sided body, the more extensive brilliant green marginal highlights on the head and pronotum – it was, indeed, C. lengi! The close resemblance of C. lengi to C. formosa is not the result of a close relationship, but rather an example of convergent evolution in response to similar habitat. Cicindela lengi is actually more closely related to C. tranquebarica (oblique-lined tiger beetle) and other species formerly placed in the now defunct subgenus Tribonia. As the first finder, Chris had first photo honors as well while I stood back, ready with the net should it spook and become uncooperative. It did make a few short escape flights at first, but as I’ve learned before this species tends to make very short, weak flights before dropping straight down, making it rather easy to follow even on the steep embankment that we found ourselves. This contrasts with C. formosa, whose long, powerful escape flights and bouncing tumbles upon landing can make them difficult to follow. Eventually it became accustomed to our presence, and after Chris was satisfied with his photographs it was my turn. We then we took turns again just to make sure we really got the shots we wanted. Cicindela lengi - note the obliquely straight humeral lunule and relatively narrow, parallel-sided body. It’s a good thing we didn’t pull the plug on Monroe Canyon that day, as tiger beetle activity really picked up during the afternoon hours. Not only did we end up seeing several individuals of C. lengi during the next couple of hours, but also a few individuals of C. formosa and C. scutellaris and a single, seemingly misplaced Cicindela denverensis (green claybank tiger beetle), more fond of clay substrates than sand) – making Monroe Canyon a veritable “hot spot” of tiger beetle diversity. While Monroe Canyon may not equal Willcox Playa, Laguna del Perro, Salt Plains National Wildlife Refuge, or Florida’s Road to Nowhere, six species is still a respectable amount of diversity by any measure, especially for a dry, upland site (all of the other sites mentioned are lowland saline habitats that owe their tiger beetle diversity at least in part to their broad range of available moisture zones). After two days in the field, our trip total now stood at ten species, and in retrospect we were lucky to see C. lengi when we did as our subsequent search of the C. lengi spot 4 miles east of Harrison later that day turned up nothing. Brilliant green highlights contrast spectacularly with the red body and bold white markings. This entry was posted in Cicindelidae, Coleoptera and tagged beetles, entomology, insects, landscapes, nature, Nebraska, science, tiger beetles. Bookmark the permalink. I’m so glad you stayed there too! Beautiful shots, Ted. What a fantastic day you had. All of that red and green makes lengi look like he’s got the holiday spirit. 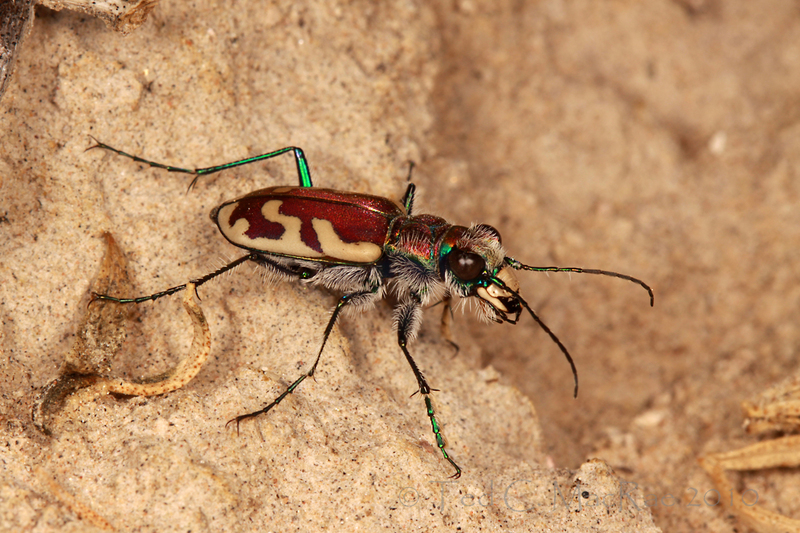 I’ve got a few tiger beetle pics that I have not yet posted, been saving them for AIF. 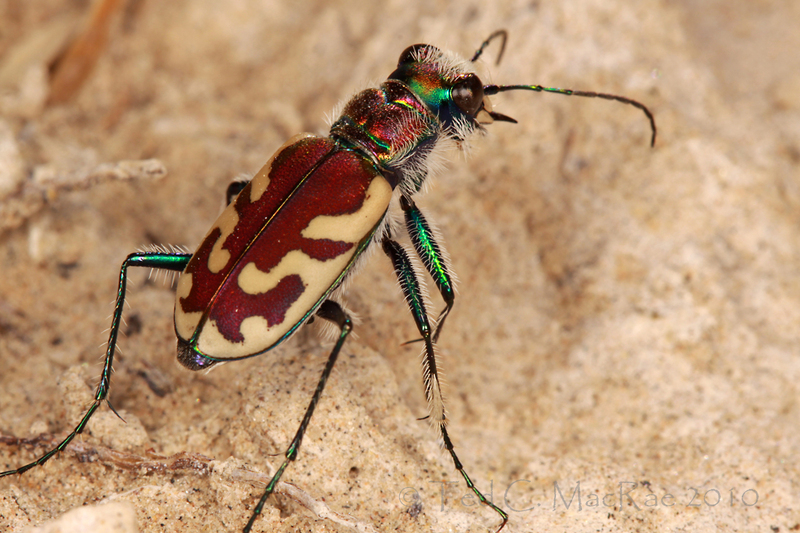 While my pics and species won’t be new or great, I’ll at least be able to add to the Tiger Beetle Fever you’ve been stirring up with all of these amazing trips and images. I’m anxious to see what tiger beetles you’ve found and how your photos of them turned out. Congrats on finding these beautiful tiger beetles again. Love the beautiful marking and iridescent green legs. It really is one of the prettier species we have. 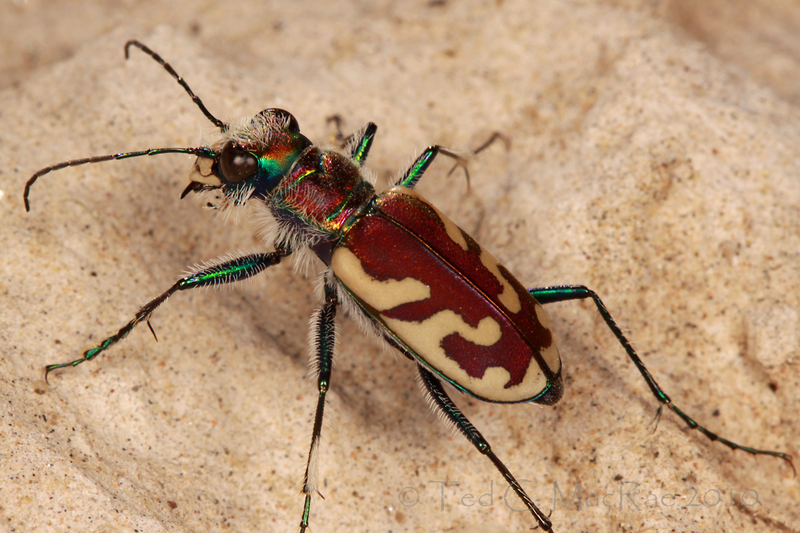 Of course, I’d give anything to look for tiger beetles in Malaysia some day – you’ve got some real stunners! Well worth the effort, your shots are stunning. Thanks for the info. Thank you Tom – I appreciate the comment. Excellent photos of a very handsome beetle! By the way, I had a nice chat with Barry Knisley last week and your name came up! Thanks Art. Next time you see Barry, please give him my regards. Great photo of this beautiful area and a beetle dressed for the holidays! It really does have the Holiday colors going – thanks Anne. I didn’t note the ants in particular, but there was quite a diversity of ‘bugs’ in general – a common theme with “roadcut canyons” out west in my experience. If only you had more time at that site. My list of species I’ve gotten there is: C. formosa, C. scutellaris, C. tranquebarica, C. lengi, C. purpurea, C. denverensis, C. splendida, and C. punctulata. I’m surprised C. splendida occurs there – I would have expected C. limbalis instead.